Key Difference: Convection ovens are actually ovens similar to the original ones with an extra feature, fans. The only major difference between the conventional ovens and convection ovens are the fans. Toaster ovens are ovens that are small electric ovens that have a front door, removable wire rack and removable baking pan. Ovens are important for cooking and feeding ourselves, which happens to be one of the most important requirements for surviving. Ovens are also not limited to cooking and heating, there are various different ovens that are used for other purposes such as glass blowing, ceramic making, brick heating, etc. These also play very prominent parts in creating utensils or objects for daily use. With the latest technology improvements, there are many different types of ovens that have a more focused purpose such as convection ovens for cooking and baking, while toaster ovens are used for toasting as well as baking. Convection ovens are actually ovens similar to the original ones with an extra feature, fans. The only major difference between the conventional ovens and convection ovens are the fans. Convection ovens are also powered by gas or electricity. The fans allow the heat provided by the gas burners or electric coils to circulate throughout the enclosed space. Convection style cooking was discovered in the 1960s, but did not gain popularity until recently. The purpose of installing fans in the convection ovens is to allow the fans to push the air to all the parts of oven creating a stable temperature for even cooking. Convection ovens have been known to provide a more even cooking, along with having the ability to retain juices when roasting meat. The even cooking and temperature reduces the cooking time, allowing the food to cook faster and saves electricity or gas. However, it has said to dry out baked goods such as cookies, bread and cake. 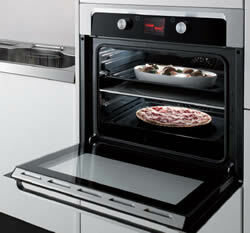 Today, convection ovens are available as an added feature to normal gas, electric or microwave ovens. Toaster ovens are ovens that are small electric ovens that have a front door, removable wire rack and removable baking pan. These ovens are often larger than toasters, but smaller than conventional ovens. Most of these toaster ovens are known as OTG or Oven, Toaster and Griller as it has the ability to perform all three actions. It can be called as a pint-sized, portable oven. It can easily be shifted to any counter or platform and does not require any additional set-up to work. Toaster ovens work on electricity. Toaster ovens have various different settings such as toast, bake and broil along with temperature gauge and timer to select the desired temperature and the time. The toaster oven can be used for baking goods such as small cakes, cookies, bread, etc. as well as have a broil setting for roasting meat, fish, eggs, etc. One setback for the toaster oven is that it cannot be used for anything that requires boiling, such as making rice or other food items. Once the food that is placed in the oven is done, the oven will automatically turn off. The person would have to manually open the door and take the food out. Convection ovens are more costly compared to normal ones; especially if they come as a feature included in gas and electric ovens. It is almost in the same range as the microwave. It is a plug-and-use appliance. For toasting, baking, grilling and broiling. Convection ovens are powered by fans which help circulate hot air throughout the oven, causing it to heat faster and provide a more even cooking. Heating is a bit as the electric coils take time to heat up. Cooking time is reduced due to air flow. Toaster ovens take a little while to cook, similar to conventional ovens. In the long run convection ovens are better as they reduce the cooking time and save on energy and natural gas bills. Toasters are economical as it works on electricity. It does not consume too much electricity. However, economical ability varies depending on the usage of the device. A more even heat distribution as the fans allow the hot air to travel in all directions in the oven. Toasters do not provide even heat. They do not have a fan to provide even distribution. Toasters have more heat where the coils are. Temperature is really easy to manage as the fans automatically manage the set temperature. Temperature is managed using temperature controls. The heat can be set to desired temperature, depending on what is going to be cooked. Runs on burners, or electric coils. Toaster ovens have electric coils for creating heat. Convection ovens are more economical in the long run, have a more even heating, reduces the cooking time and has an option to switch back to conventional oven setting. Toaster ovens are similar to cheaper and more compact versions of conventional ovens. They are perfect for baking, broiling, roasting and toasting. It is also quite cheap compared to the big conventional oven. Expensive to purchase, not good for baking goods that require moisture. In case adhering to a certain recipe the temperature will need to be adjusted according to convection oven. Toasters can make only limited amount of food (for example, only small cakes can be made as the oven is small); takes time to heat up and cook. It also has uneven heat distribution. Toaster ovens are also unable to make foods such as rice or boiling.